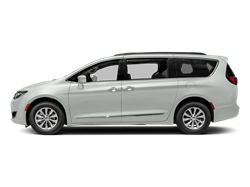 Crystal Metallic 2019 Chrysler Pacifica Touring L Plus FWD 9-Speed 948TE Automatic 3.6L V6 24V VVT 2019 Chrysler Pacifica Touring L Plus in Crystal Metallic, 18`` x 7.5`` Painted Aluminum Wheels, 360 Surround View Camera System, 7 & 4 Pin Trailer Tow Wiring Harness, Adaptive Cruise Control w/Stop & Go, Advanced Brake Assist, Advanced SafetyTec Group, Automatic High Beam Headlamp Control, Blind Spot & Cross Path Detection, Full Speed Forward Collision Warning Plus, Heavy-Duty Radiator, Hitch w/2`` Receiver, Lane Departure Warning Plus, Michelin Brand Tires, Navigation System, Parallel & Perp Park Assist w/Stop, ParkSense Front/Rear Park Assist w/Stop, Power Open/Close Shade, Quick Order Package 27J, Rain Sensitive Windshield Wipers, Reclining 3rd row seat, Tire & Wheel Group, Trailer Sway Damping, Trailer Tow Group - 3,600 lb Rating, Tri Pane Panoramic Sunroof. Hello, I would like more information about the 2019 Chrysler Pacifica, stock# 9C327. 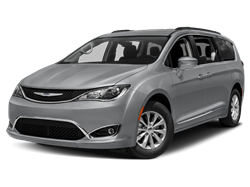 Hello, I would like to see more pictures of the 2019 Chrysler Pacifica, stock# 9C327.